As the temperature continues to drop in the Chicago area, we are anticipating very cold weather throughout the winter season. If you own a home with a detached garage, you are probably wondering what you can do to keep your garage warm while avoiding high costs. By taking the proper preparations, you can heat your garage in an efficient and cost-effective manner. It is always a good idea to insulate the walls of a detached garage with fiberglass batt insulation. This insulation should be installed with the backing facing inward toward the garage. This will reduce the chance of fiberglass particles escaping and landing on people’s clothes or skin. When installing fiberglass batt, it is a good idea to wear protective gear such as gloves, eye protection, and a dust mask to keep the particles from entering your eyes or mouth or touching your skin. Caulking is a good way to close up all cracks in the garage that let air inside. The wood around door frames may have warped over several years and will need to be resealed. If you can see any light through cracks when the garage’s interior lights are turned off, these cracks should be sealed with silicone caulk. Portable heaters are a very efficient way to heat a detached garage during the winter. 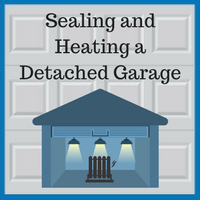 Central heating is often too expensive to install in a detached garage, and a small space heater can be used to provide heat while the garage is being used. Space heaters can use convection to circulate warm air throughout the garage, or by radiant heating, in which infrared radiation is emitted to directly warm people and objects within the heater’s line of sight. Radiant heating can be more efficient when using a garage for a short period of time, since this type of heater will only heat its immediate surroundings rather than the entire garage. Space heaters can operate using either combustion (burning fuel such as propane or kerosene) or electricity. Combustion heaters must be properly vented to keep carbon monoxide from building up inside the garage. Electric heaters provide greater safety by eliminating the need for venting, but they are typically more expensive to operate. With proper planning, you will be able to keep your detached garage warm in the winter without spending too much money. If you have any questions about how to insulate and heat your garage, you can count on Blue Sky Builders to help. We have over 38 years of experience in the garage sector, so you will be guaranteed professional and efficient customer service. Please contact us at 630-852-8485 today. To check out our work, please visit our gallery.